CARA are delighted to announce their second Scottish tour in September 2018, celebrating their 15th anniversary on the international folk scene and their seventh release: a new live album. Audiences can expect innovative arrangements of material firmly rooted in the Irish and Scottish traditions, critically acclaimed original songs and tunes, and several brand new pieces. Uplifting, energising and expressive, with lead vocalists Gudrun Walther (Germany) and Kim Edgar (Scotland) alongside piano, fiddle, flute, whistles, guitar, uilleann pipes and accordion, CARA have been described as “a whole festival wrapped up in one band” (Bruce MacGregor, BBC Radio Scotland). The band are delighted to tour Scotland for the second time, after launching their latest studio album, “Yet We Sing” at Celtic Connections 2016. 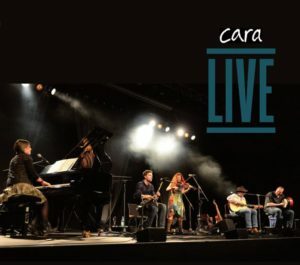 CARA also enjoyed a recent performance at the 30th Cork Folk Festival, and last year they headlined Main Stage 2 at Shrewsbury Folk Festival and completed their first English tour.